Photo taken by J. Ahern at the Brookfield Zoo exhibit Zoo Bugs. This is an example of how bugs merge and camouflage themselves to avoid becoming dinner for another bug or animal. Brookfield Zoo’s interpretation of this is a bit extreme, however, the name of the exhibit is “Extreme Bugs”. 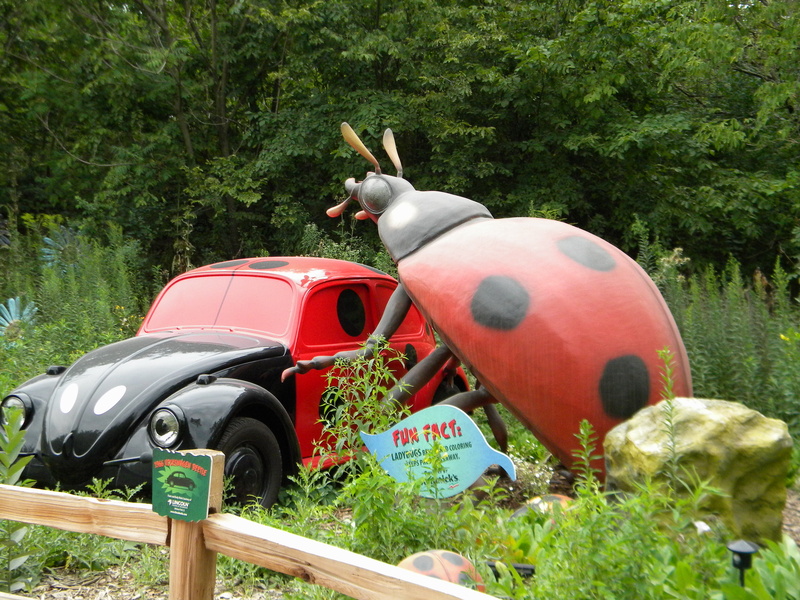 Some people believe that the “Lady Bug” is a lucky and magical bug. It is said that if a Lady Bug lands on you, then good luck will follow. I wonder if this extreme Lady Bug is even luckier than the average garden variety. There is a story from the Middle Ages where the crops were being eaten by insects, and people were starving. They prayed to The Virgin Mary for relief. The village was disappointed in their prayers when they discovered yet another insect in their fields. Their disappointment was short-lived, however, when they realized that these bugs were killing the insects that had been dining on their food supply. They called these wonder bugs, Lady Bugs. Lady Bugs love to eat aphids. So if you have aphids on your roses or tomatoes, head on over to the garden center and purchase a carton of Lady Bugs. They are sure to solve your problem. Check out the Weekly Photo Challenge: Merge at the Daily Post. You still have time to submit a photo. Posted in Words of Wisdom and tagged Brookfield Zoo, Exhibit, Extreme Bugs, Good luck, Grandmother Musings, Lady Bugs, Luck, nature, postaday, Weekly Photo Challenge: Merge, zoo exhibit. Bookmark the permalink. Jamie, you had done an awesome interpretation of the merge concept. I really love the story of the Middle Ages. THey brought you a whimsical picture. I love seeing Ladybirds on my brassicas and roses! We don’t get enough of them here though, although one year there was an absolute plague of them all across Britain. I wish that would happen again! Love your take on the challenge. Thank you for the information on the Lady bug. I knew about it bringing good luck but not about the story from the Middle Ages. Great post. LOL! Great picture, and thanks for including the history of the name… I’ve heard them called both ladybird beetles and lady bugs, but either way, just like my garden spiders, they do keep the plant-eating bugs down! I love VW Beetles! My husband wants to own one someday and paint it like Herbie the Love Bug! This pic really made me smile and I have always thought Lady Bugs brought good luck, not that I’m superstitious or anything I just like them. Love the story and the Lady Bug history! And such a great picture!!! Very Creative website! New blog on the History of the Ladybug go to eblogger dot com search for History of the Ladybug.